We could, for convenience, visualize India as a large ship jointly owned by us, the citizens. Elected political representatives can then be likened to a captain hired to take this ship to a desired destination. Bureaucrats, the next layer of public managers, are its sailors. There is a wide range of Bureaucrats including public servants, defence forces, police and the judiciary. Our political representatives constitute our government and the Bureaucracy the machinery of the government. It is our political representatives’ task to design and use this machinery to deliver upon the agreed objectives for which we have hired them. Bureaucrats are directly accountable to our representatives and only indirectly to us. 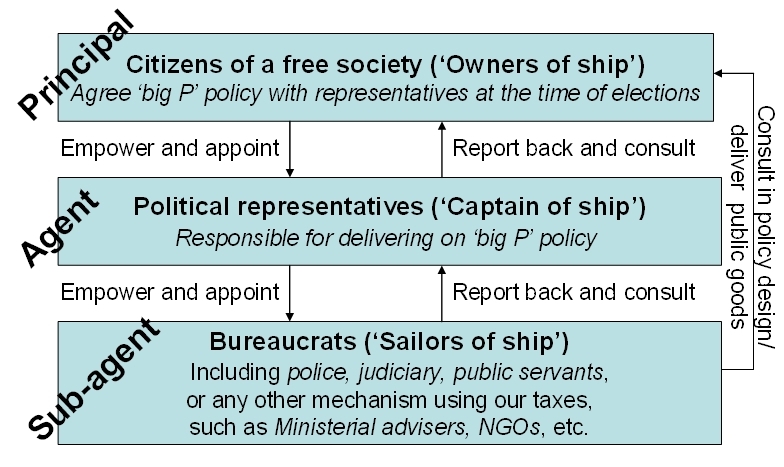 This relationship between citizens, who are the sovereign principals in a free society, and their agents and sub-agents is depicted in the diagram below. For a free society to have a good Bureaucracy is almost as important as having a good political leadership. But India’s bureaucracy falls well short of international best practice. Indeed, to say that our Bureaucracy is sloppy, sluggish, inefficient and therefore ineffective is perhaps an understatement. It won’t do us any good to get outstanding political leaders generated by the reforms outlined in the previous chapter and then force these leaders to use the shabby Indian bureaucracy to deliver results. Having used the term Bureaucracy (do note the capital B, though) in an unusually broad sense so far, I’ll now revert the use of this word to its more common meaning, namely, as the public services. Within the Indian public services, I’ll focus almost entirely on public service leaders, primarily on the Indian Administrative Service (IAS). Pranab Bardhan, a well-known Indian economist, has rightly suggested that we should create a structural shift in the level of internal competition in the bureaucracy. ‘It is anomalous to expect [economic] reform to be carried out by an administrative setup that for many years has functioned as an inert, arbitrary, heavy-handed, often corrupt, uncoordinated, monolith. Economic reform is about competition and incentives, and a governmental machinery that does not itself allow them in its own internal organization is an unconvincing proponent or carrier of that message.’[i] To advance Bardhan’s perfect diagnosis, I will compare and contrast the Indian and Australian bureaucracies, having worked in them for a combined period of over 25 years. The first thing to note is that the quality of personnel who hold leadership positions in Australia is significantly better than their Indian counterparts. This difference magnifies even further at the lower levels of the bureaucracy. Australian bureaucrats are significantly better in leadership skills and possess not only extensive specialist policy knowledge but also impeccable personal integrity. The Australian delivery of governance services is superior because its public service leaders are outstanding. By no means do I imply that public choice theory does not apply to Australia. Indeed, most civil servants here, as anywhere else, behave in a manner entirely consistent with such theory. But carefully designed incentives have ensured that their self-interest is aligned with the public interest. In particular, contractual appointments at the senior levels and absence of tenure ensures alignment with political representatives’ policy goals. Further, internal competition ensures that only the best public servants rise to the top. In India, on the other hand, while we pay attention to the principles of competition and merit in assembling our cricket team, which is therefore internationally competitive and can even beat Australia on a good day, we do not apply such principles to our bureaucracy. This has led to the vast chasm that I have noted above in the performances of these two bureaucracies. [i] In his 2003 oration – see Jha, Raghbendra, ed, The First Ten K R Narayanan Orations: Essays by Eminent Persons on the Rapidly Transforming Indian Economy, ANU E Press, The Australian National University, 2006. Available for downloading from [http://epress.anu.edu.au/narayanan_citation.htm]. Recently I had an email conversation with a friend who works in the World Bank. (She did her doctorate in economics along with me in the late 1990 from the University of Southern California and has been with the World Bank since then). In her email she referred to India's sterling performance in attracting private sector funding for its infrastructure and sought my views on this phenomenon. Since I have spent the last ten years focusing on governance reforms and on regulatory policy, I have not spent too much time on infrastructure issues. Here's a quick summary of the situation, extracted from various sources on the internet today. (Before I move on to an overall analysis of the situation, let me mention in passing that Victoria's public-private partnership program (see the website here) is considered to be one of the world's most advanced and successful programs, with 21 projects worth around $10.5 billion in capital investment. Should my friend be interested in pursuing this idea further she could visit Victoria to find out more about how this program works). In my view, despite these positive efforts, India is seriously governance-constrained, leading to an inability to provide education, health, water, sanitation, and energy. That is where my focus has been – on building the governance capability and systems that will then deliver the rest of the detail. Our governance holds us back. That is why I have spent my energy on this issue and will continue to do so. The reform of infrastructure is one part of the story of reforms needed in India, and we are simply not even one tenth through that journey, yet, with mega-corrupt and incompetent political parties governing India. I remain convinced that a (classical) liberal political outfit is needed to bring true reforms of governance to India. The task at hand is simply too great to be achieved by tinkering at the margins. That is why I have worked only on building a liberal political party for India – something we have not had since the Swatantra Party was disbanded in 1974. To achieve that end there is now in place the Freedom Team of India where India's future leaders are currently assembling. The kind of governance reforms that India needs (and most developing – and developed countries too!) are outlined in my book, Breaking Free of Nehru. That is what I'd like everyone to consider. The rest of the things will fall in place once the governance systems are reformed. Let me emphasise once again that India cannot achieve its potential just with so-called capitalism which is often (but wrongly) understood to mean (only) economic freedom. Without an appropriately designed machinery of governance, there can be no capitalism. Apart from reforms to India's economic policy, therefore, VERY significant reforms are needed in the way we elect and remunerate our politicians, and in our bureaucracy. I have outlined the reforms to the electoral system and bureaucracy at some length in BFN (chapters 4 and 5), and encourage you to go through these chapters in detail. In addition, I have summarised the reforms needed to India's bureaucracy in an article in the Times of India and a later article for Freedom First. PIease read these to appreciate the outlines of the system of bureaucracy that India needs so it can effectively deliver the few objectives of a good government in India. In brief, as you will note, the IAS must go. That COLONIAL system of bureaucracy is so badly antiquated and ineffective that it amazes me why we have not replaced it with a functional bureaucracy. I'm extracting below a section from BFN's Online Notes. Those who have read my book know that at the behest of the publisher I had to remove a significant chunk to make the book shorter. The remaining material, below, relating to the history of India's public administration, was excluded from the main book and is available online. It has not undergone the editorial scrutiny of the publishers and has more spelling errors than BFN does. It is important, I believe, that we all make an attempt to understand the history of India's public administration. Doing so will show us how India's administration has failed to keep pace with changes and why has India now has one of the world's worst administrations. The Indian system of public administration is thought to be one of the world’s oldest, barring perhaps the Chinese. In 322 BC “Chandragupta … established a complex bureaucracy to see to the operation of the state and a bureaucractic taxation system that financed public services”. Among the more recent advances in public services in India, the model of land revenue collection designed by Sher Shah Suri in the 1540s is acknowledged as a major milestone in systematic governance. The Sher Shah model was then adopted by the Mughals and later by their successor—the East India Company. The East India Company was one of the world’s oldest joint-stock companies; hence a pioneer. Like any good modern private company, it had built its own set of rules and procedures by 1757 to ensure that business policies laid down by its Board of Directors were complied with across its entire trading business. But after Clive’s political triumph of 1757 at Plassey, the Company was faced with the entirely new challenge of governing vast numbers of people and extensive areas of land, initially only in Bengal. It became a private company that ‘ruled’ people: a unique combination. It had to quickly come up with policies to deal with this completely new role. The bureaucracy it invented in response to this challenge was perhaps the first modern bureaucracy in the world. This bureaucracy was not accountable to the whims of kings, but to a private company’s Board of Directors; it developed as a private sector bureaucracy. The Company started by creating a Covenanted Civil Service (CCS) whose members signed ‘good behaviour covenants’ with the Company’s Court of Directors. With a view to keeping wage costs low, members of this service were paid relatively modestly but they could ply their own commercial business on the side and thus make commissions on their trading activities. As would be expected, this model led to serious conflicts of interest. Given the lucrative opportunities created by the political patronage of their commercial activities, corruption began to flourish in British Bengal. That Robert Clive was impeached (unsuccessfully) on this ground says something about the enormous possibilities of corruption at the confluence of India’s feudal culture and a modern joint stock company which did not have checks and balances for its new role as a government. The very concept of corruption being an impropriety was perhaps recognised for the fist time in India at this stage. Officers had been expected to use their office to coerce villagers into submission in all previous monarchical regimes. The British officers’ corruption was quite customary for India till then; no one thought it was improper. Chanakya had noted such natural tendencies among officers in his Arthashastra 2,400 years ago (“The Mahamatras are like fish. Does one know, when the fish is drinking water?”). However, the expectation from public officers was changing. The change started in England where the Magna Carta of 1215 instilled some discipline in the king’s officers. The king of England agreed through this charter that ‘No Constable nor other Bailiff of ours shall take the corn or other goods of any one, without instantly paying money for them.’ This was revolutionary, as it created a new expectation that a public servant was only to live off his own salary. Therefore the corruption in British Bengal was not commented upon adversely in India. It was in England that concerns were raised about it. The British Parliament took about a decade to make he Regulating Act of 1773. This Act created a Governor General for British India. A subsequent India Act,1784 laid the specific principles of governance of India by the Company. We cannot blame the British Parliament for taking so long to do something about corruption in India (it at least took some action: India’s Parliament, on the other hand, actively encourages corruption!). The British Parliament was relatively weak at that stage, and also unrepresentative. It was only in 1688 that it had gained the authority to continue to assemble without long interruptions imposed by British kings. The second Governor General of British India, Lord Cornwallis (1786-93) seems to have laid the foundations of the modern Indian public services. He split the Company bureaucracy into two parts: the political branch responsible for civil governance, and the commercial branch responsible for its commercial activities. On entry, an officer of the East India Company had to opt for one of these branches. Commercial officers retained access to commissions on their trading activities. Those who opted for the political branch were compensated by Cornwallis through a significant hike in salary. With this, corruption came to a grinding halt in the higher echelons of British India’s government. Till independence, these higher echelons would distinguish themselves by remaining spotlessly clean. Indeed, this continued well into the early years of independent India even as our politicians were starting to become super-corrupt. The political branch attracted talented British middle-class youth with scholarly tastes and policy interests. Wonderful writers emerged from amongst them who penned elegant and largely accurate accounts of the lives of ordinary Indian peoples. In some cases, these civil servants proved pivotal in the development of local Indian dialects and languages. They compiled dictionaries; even created scripts. The role of the District Collector, perhaps found only in India, also further evolved and became the hub of British administration. This office was particularly important given the poor means of communication available in those days, with the attendant need to empower local officials to make decisions on the ground without waiting for prior approval. To streamline the processes of administration, Cornwallis created a civil service manual as part of the Charter Act, 1793. Carrying on Cornwallis’s foundational work, Lord Wellesley set up the Fort William College in Madras in 1800 to induct new entrants to the CCS. This college was moved to England in 1805 and became the Haileybury College. (A tidbit: among the teachers at Haileybury was the famous Thomas Malthus who was its first professor of Political Economy and taught British India’s civil servants from 1805 till his death in 1834. They were also taught the latest economic and political thought, including Adam Smith.) The Lal Bahadur Shastri National Academy of Administration at Mussoorie continues the tradition established in 1800, imparting a two-year induction package to new recruits. Given increasing concerns that appointments to the CCS by the board members of the Company were not made exclusively on merit, the Company threw the Indian civil service open to competition in 1853. This was a significant reform that even Britain would not implement in its own government for the next sixty years. In 1854, William Gladstone commissioned Northcote and Trevelyan to report on the future of the Civil Service in England. [Addendum: Those interested in history will note that Charles Edward Trevelyan married T.H. Macaulay's sister and later became Governor of Madras, apart from holding senior positions in England. His son wrote the life and works of Macaulay]. They studied the British East India Office as a model, and a few other government offices in England and recommended that civil servants in England should also be recruited through an open competitive examination, and that promotions should be made on merit, not on the basis of seniority. The frequently cited precepts of an apolitical permanent career service, being not only recruited without political patronage but whose members offer impartial advice to the political leadership, arose from this report. When Gladstone became Prime Minister in 1868 he implemented some of these recommendations. Competitive entry started in England only in 1914. In the meantime, the British India civil service had kept up its lead in public service reform. The Indian Civil Service Act was made in 1861. Next, the recommendations of the Public Service Commission of 1886-1887 were implemented. Later, in the 1910s, in response to Indian nationalists, the British allowed Indians to take the entrance examination for which they had to travel to England. From 1922, India was made an examination centre. The number of Indians in the ICS began to steadily rise. At the time of independence, in addition to the generalist civil service, the ICS, which provided high level governance functions, India had evolved nine other central services which managed specialist areas. The point of sketching this history in some detail was to highlight that by the mid-1800s, the Indian civil service was perhaps at the cutting edge of public administration in the world. Regrettably, India’s public services have stagnated since then while the rest of the world has continued to evolve and reform. The design of the IAS today is based almost entirely on the model of 1853. The most important public administration reforms in the world since then include the abolition of tenure in the top echelons of the public services, and bringing in significant political strategy alignment. Let’s explore these changes.